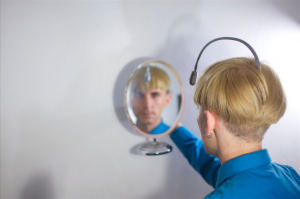 This is the last of our 6 part series from our interview with Neil Harbisson, the first human cyborg. The camera attached to the antenna embedded in his skull identifies color using sound to compensate for his complete colorblindness. For a diagram of how it works, check out this IDEA Visualization in the TED Blog. We’ve discussed how the cyborg technology works and changes the whole concept of color associations, how it influenced his education, music and art, and any new cyborg technologies like infrared detection that are integrated into the chip in his skull. We end the interview by getting personal with Harbisson, to find out what it’s really like to live as a real life cyborg, how the camera works, and how being a cyborg human impacts his health as well as how he deals with airport security. 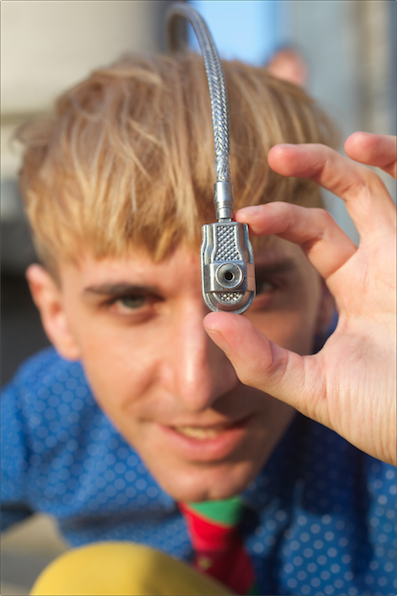 Lastly, we ask Harbisson how he sees himself, as a cyborg artist or musician, and how he is part of the new cyborgism movement. Munsell: With the constant sounds of color in your head, do you ever get migraines? How do you find silence? NH: I did at the beginning, yeah. The first five months I had strong headaches, because there is colour everywhere so it’s constant input. White and black are silent, so if there’s a white space, for example, I could just listen to the ceiling and the ceiling has less colours than what I have in front of me. Munsell: So it’s totally flexible. Munsell: How is the antenna attached to your head? NH: It’s been drilled inside my skull, so there’s an input, like 3 inputs. Two for the antenna, one for the audio input, so it goes inside the skull and then the antenna and the bone just merged. Munsell: So you can’t take it off? NH: No, it’s a permanent body part, so I feel it’s just an antenna that goes in my head. Munsell: Was there any discussion of making something that you can snap in or detach if you ever wanted to take it off and put it back on later? NH: Yeah, well, for example, the lens can be changed, so I can upgrade the lens and the antenna can be cut and then I could add a new one. So, it’s like a tail or an antenna, but it can be upgraded, I guess. But I don’t think I will actually need to. Munsell: Did you ever want to have one that you could detach? NH: No, my desire was not to have anything wearable. I wanted to have a body part, so I wanted it to be something permanent. Munsell: So when you’re on an airplane, and they say to turn off your electronic devices during take-off and landing, what do you do? NH: I just wait, because they usually come and ask me to stop doing whatever I’m doing. There’s always a problem with this, yeah. But I can switch it off. Munsell: So every time you fly you have to explain everything? NH: I feel it’s like giving a conference, because they ask so many questions. However, at some airports, they already know. Munsell: Do you drive? Can you perceive colors of traffic lights and signs if you’re driving by fairly fast? NH: No [I don’t drive]. In most cases colour is not essential to driving. Because traffic lights have a position so if you see the light you know what it is, usually. Munsell: But would the camera be able to pick it up if you were going by quickly? Is it sensitive enough? NH: It should. But it would also depend on how fast you go or the light as well. It depends. Munsell: How far a distance can the camera detect? NH: It’s not based on distance, it just picks up the dominate colour, but you could also use an eye tracker so that it keeps changing the sound of the colour depending on where you look. So you could use an eye tracker there and then it would detect your pupil. Munsell: What kind of lens is in there? Was it specially made? NH: It’s just a basic camera that detects near infrared and near ultra-violet. It’s modified from a camera that you can buy. It’s been modified so that it only detects hue and saturation when the chip receives the information. It’s based on the hue and the saturation because I don’t need to transpose light into sound. So just the hue is transposed into notes and the saturation into volume levels. Munsell: So, for your identity, do you see yourself more as an artist, or a musician, or an activist? NH: I guess I’m an audiovisual artist, because that’s both audio and visual, and in my case, it implies both things. So I’m an audiovisual artist, but in a very particular way. Most audiovisual artists work on video, but in my case everything is audiovisual, so even if I paint with paint, it’s still audiovisual art or if I play the piano it’s audiovisual art. So my life is totally audiovisual. But I never called myself an audiovisual artist, so I think contemporary artist fits better because it includes the fact that I’m using cybernetics to extend your senses and express yourself though new senses, like for me is an art movement, cyborgism. And I believe that I am part of this cyborgism movement. Munsell: How many cyborgs do you think there are? Are there more out there than you’re aware of? NH: I don’t know, because, I think the definition of cyborg is different depending on each country or each person. So I believe that a cyborg is someone that feels that he or she is technology and then this could be anyone. Maybe someone feels that they are technology even if they don’t have anything implanted, but they feel that the mobile phone is a part of their body or something. So if someone feels like this, or someone feels extremely connected to cybernetics and they feel that they are cyborgs, then I guess they are. So I think that being a cyborg is more of a feeling, not a status. And I feel like cybernetics is a part of me, mentally and physically. So I feel that I am cyborg, I feel that I am technology. In a subsequent conversation with Neil Harbisson, we asked him if there was a medical procedure available that could restore the ability for him to see color, would he replace his cyborg technology to hear color in exchange for being able to see color like everyone else. He said he would want both. Of course he was curious to experience color sight, but the ability to hear color is so integrated into his senses at this point that he wouldn’t want to lose that capability. 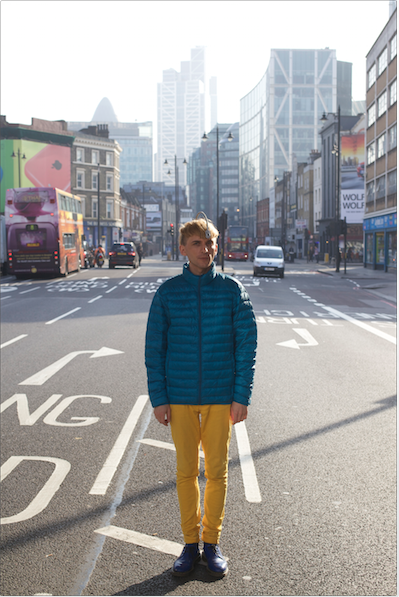 We hope you enjoyed our interview with Neil Harbisson and found it as fascinating as we did. Talking with him brought a whole new dimension to our preconceived concepts of color perception and the human senses. To read the interview series from the beginning, you can start at Neil Harbisson – Part 1: Rearranging the Senses of Color Sight and Sound.